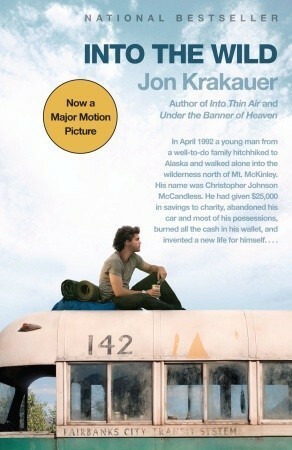 Remember my review from six months ago about Jon Krakauer's Into the Wild? No? Don't worry, I didn't expect you to. Although if you did, I'm super flattered. Without going into a re-review, Into the Wild is about a young man named Chris McCandless who was so enamored by living in the wild, without any of the modern conveniences that we all take for granted, that he left his family after school and went to live on his own. Within a span of a year and a half, he had been places but Alaska was always the territory he wanted to conquer. He finally got there, made his own living by hiking, hunting, reading and simply, living in the wild. He knew his botany well, but unfortunately, he ate something that disagreed horribly with him, eventually causing him to die of starvation. In my review, I whined quite a bit about how McCandless had scant regard for his own family. To me, he was one of those who gave a lot of interest in other people, but wouldn't give any respect in his own house. He never bothered to write home in the two years that he was away, sufficient time, in my mind, to at least send a note. Despite my exasperation with him, McCandless stayed on in my mind as a guy who, however stubborn or arrogant he may have been, didn't deserve to die doing something like living in the wild. He kept coming back to me, occasionally, and I felt it such a pity that nobody could even reach a consensus on how he died. Krakauer made a speculation in his book that it was the seeds of wild potato that killed him. The reason that nobody bought that was because botanists have established for ages that wild potato seeds are safe for ingestion. This is sort of like someone saying that the sun actually rises in the west. So the speculation continued. In this New Yorker article, Krakauer explains how a writer named Ronald Hamilton did some research to establish that wild potato seeds itself killed McCandless. Apparently, it was something used during the World War 2 as one of the many infamous debilitating experiments on Jewish prisoners. The symptoms during that experiment matched McCandless' end of days physical condition, making it more obvious that Krakauer was right all along. What baffles me though is how something that has been having potent impact on people all along, could still be in the safe-to-eat sections of scientific literature. If you have read Krakauer's book or watched the movie, the article may interest you. Irrespective of what you think of McCandless, paralysis followed by starvation due to being helpless is a really sad way to die. Thanks for sharing this! I've read the book and seen the movie and remember them going back and forth over what really happened. It's crazy that it's been so long and so much is still unknown. Interesting! I had no idea there had been controversy over the plant itself. I read the book twice, and I felt for McCandless, though at the same time felt frustration that he wasn't properly prepared for what he was undertaking. Thanks for a detailed discussion on this book, which I recommend highly. How in the world did so-called experts miss the fact that this "food" was used in experiments on people. I think that article was fascinating, and a pretty convincing explanation for both what happened to McCandless and why it was so hard to figure out. It's an incredibly sad way to die. I know, right. It's just insane. I hope that this is the answer. It feels good to know. Yeah, I was quite surprised that there was some research on this plant regarding its fatal aspects and still many scientists preferred to believe otherwise. I felt the same way. I didn't like what McCandless was doing and felt very sad for his family. No clue. It just boggles my mind. Yeah, I hope this is the answer they were looking for. Even though I didn't like McCandless, it felt bad initially to think that maybe he just made a stupid blunder. It feels good to know that he knew enough about nature.